Brusho Starter Pack - Fixed Assortment 24 colours - BRUSHO® | Colourcraft Ltd.
1 each: Lemon, Yellow, Gamboge, Orange, Vermillion, Scarlet, Brilliant Red, Ost Red, Crimson, Cobalt Blue, Ost Blue, Ultramarine, Prussian Blue, Turquoise, Leaf Green, Emerald Green, Sea Green, Violet, Purple, Light Brown, Dark Brown, Grey, Black, White & Techniques Leaflet. A comprehensive range of 24 beautiful colours. Use Brusho Crystal Colour as a wash and Colourcraft C & A Ltd Acrylic Wax as a resist in design application. 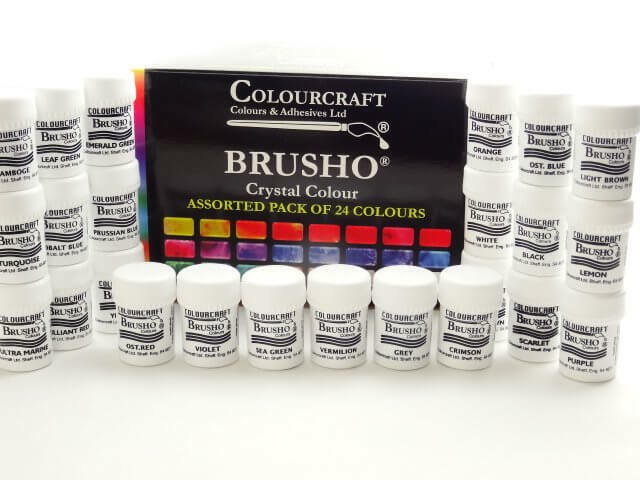 Alternatively, use Brusho Crystal Colour to colour the acrylic wax and other acyrlic mediums.